Happy Monday! I realized that I never got around to sharing with you guys what I wore for my birthday last Sunday. I didn't go out and buy anything special. I'm a pretty low key type of person. I was hoping to visit the Sugar Factory to celebrate though. However, I took a rain check for another day. Anywho... How was your weekend? Your outfit was well put together. I love everything including your hair. Happy belated birthday by the way! That is a really cute outfit. It's casual and chic! And can we just talk about how pretty your hair is for a sec? I really like your outfit! Your top is gorgeous. I love everything about it - color, style and fit. You look beautiful and happy belated birthday! This is such a great outfit. I really like the color of your top. Happy belated birthday to you! I normally am in jeans and a t-shirt on my birthday. And flats. I walk like a newborn horse in heels. I love your shirt and also Happy Birthday to you even though its late. Have a nice day and a wonderful week. You look absolutely gorgeous! Happy birthday I hope it was a wonderful day. With the way you dress I am sure you turn heads. Yes Tasheena! Loving it all, the hair, the boots, the bag! Absolutely gorgeous! Happy Belated Birthday! You look amazing. I love the sleeves on your top, you have great style! Hope you had an amazing birthday. Happy Birthday! I love the entire ensemble. The sleeves on the top are so beautiful. Happy birthday! 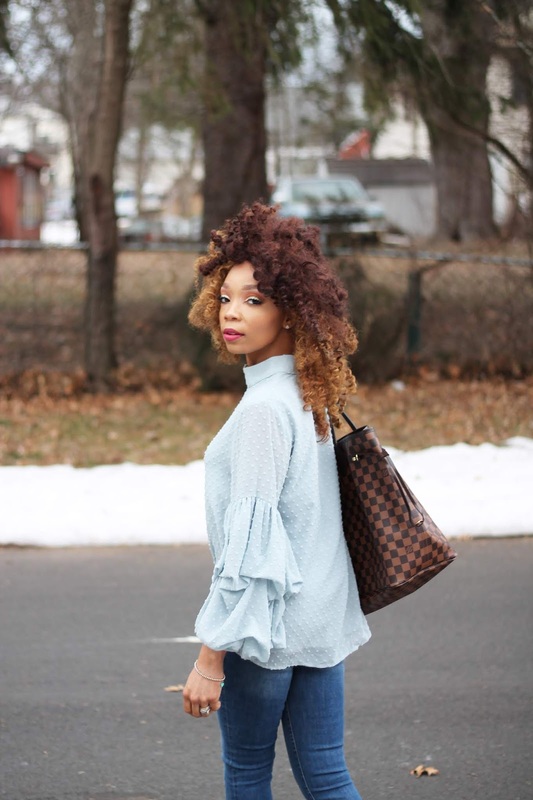 I love everything about this post: Your hair, the outfit....everything! I hope you enjoy your birthday! That blouse is absolutely brilliant! The cut flatters you so well and it's so feminine and unique! First, Happy Birthday! That outfit is so cute! I love the top. I would totally rock that. This top is adorable on you!! I wish I could wear something like that!! I can never pull off that kind of top but you definitely can, it looks great on you. I love the shoes! Happy Birthday! I love everything about your outfit! The shirt is absolutely gorgeous on you!